Instant Adhesive and Two Part Adhesive from RhinoTech each offer excessive strength when bonding mesh to frame. But, what are the differences? To answer the question with a visual component, click on this Video. It’s a thorough feature with descriptions of Instant Adhesive and Two Part Adhesive as they relate to stretching screen frames. RhinoBond INSTANT ADHESIVE is used when you need to quickly stretch a screen frame. Three varieties of Instant Adhesive are available in a Performance Grade, Economy Grade and Toughened Grade. No pre-mixing is needed with any of the grades and each offers powerful tension-holding capabilities from 70 – 90 Newtons. With an activator like RBP 1500A (aerosol) or in liquid form such as RBP 1500, these adhesives dry in 3 – 5 seconds. Use on wood or aluminum frames. Not sure which one would best suit your needs? 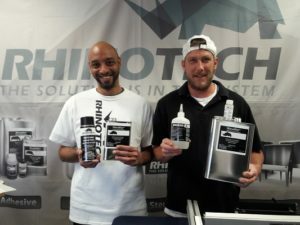 Our Customer Service Specialists and extreme Team will assist you: 888-717-4466; 651-686-5027 x 1, 2 or 4; info@rhinotechinc.com. Spread the adhesive/glue evenly onto the screen frame after mesh is stretched. Next, apply one or the other of these two Activators: RBP 1500A that is an Aerosol or a liquid activator that is RBP 1500. Once applied, the adhesive will dry in just 3 – 5 seconds. Two PART ADHESIVE is RMA 3000. It is mixed with a catalyst to ensure chemical resistance and it typically dries in 10-15 minutes. RMA 3000 is applied the same way as RhinoBond Instant Adhesive. RhinoBond Instant Adhesive comes in a 1 lb. or 16 oz. container. The Two part Adhesive, RMA3000, comes in a gallon container. Though RMA 3000 takes 10-15 minutes to dry, it become very economical when you have multiple tables of frame stretching/drying going on at the same time. If you need to quickly stretch/dry a frame, then RhinoBond Instant Adhesive is the natural choice. Time saved by not having to wait for a screen frame to dry becomes worth the money. And, that’s it. Thanks for watching this brief overview and learning about the significant ways you can ensure a strong bond of mesh to frame. We offer Free Shipping in the contiguous U.S. of A. on orders of $75 or more. And, we do ship world-wide.